A marathon contest in St. Louis resulted in a walk-off win for the Cardinals over the Los Angeles Dodgers. With their victory, the Redbirds climbed past 30% in World Series probability for the first time this October, once again threatening Boston's top spot. The Dodgers fell back into fourth behind the Detroit Tigers (who have yet to play). This leaves the Dodgers with 3:1 odds to defeat St. Louis in the NLCS and 8:1 odds to win the World Series. The Cardinals' victory also had a slightly negative impact on the Red Sox, who would benefit from not facing such a strong opponent should they advance. 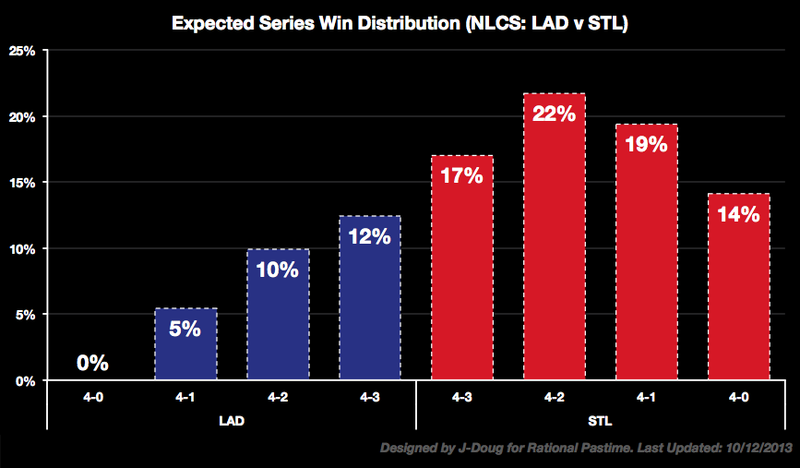 See below for series breakdowns, ratings and probable World Series outcomes. 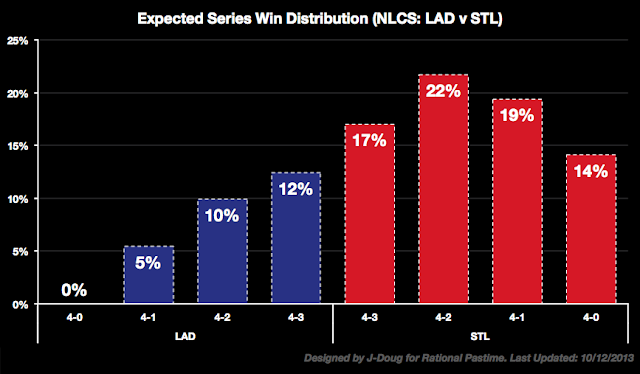 Following LA's loss, each possible Cardinals victory is now more likely than any individual Dodgers win. 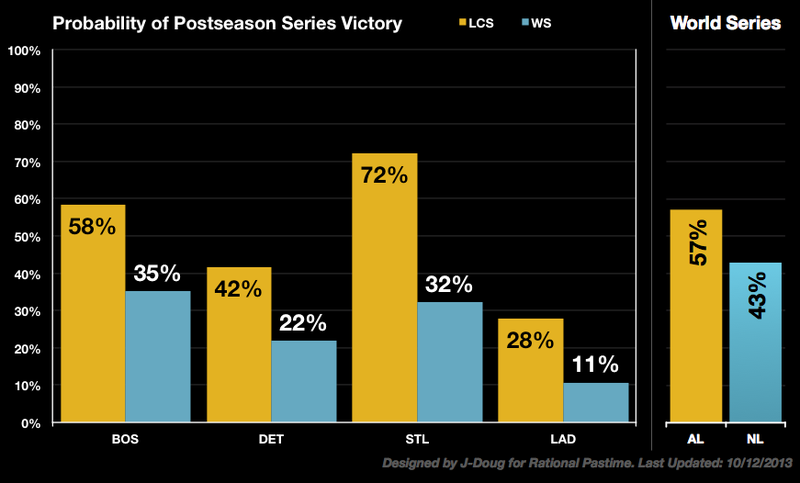 The best chance for LA is to push the series to seven games, whereas the best shot for the Cardinals is to win it in six. 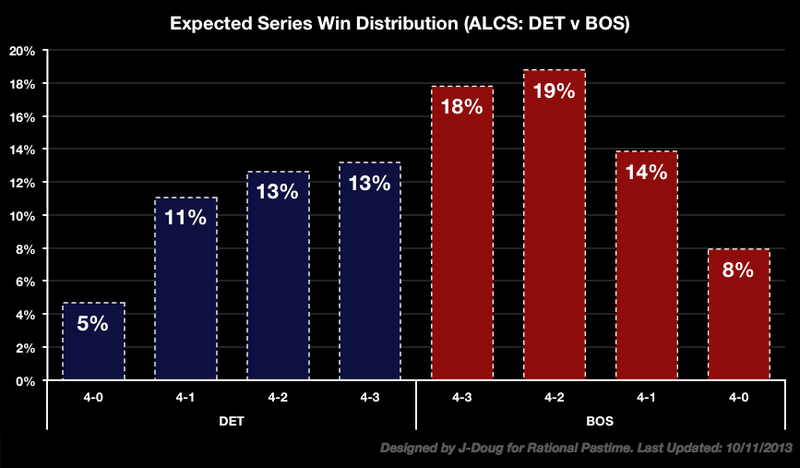 Just a reminder regarding the ALCS which starts tonight: the Red Sox are heavily favored over the Tigers. 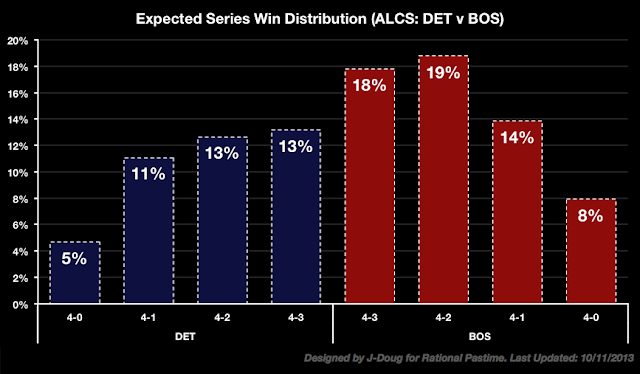 The best chance for the Tigers to reach the World Series is a win in seven, whereas Boston's best shot is in six. 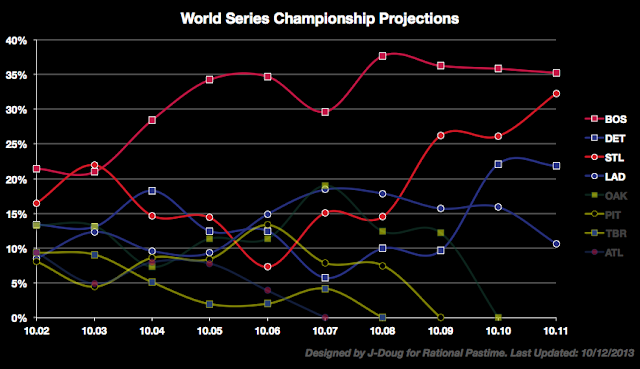 The major change in the top sixteen probable World Series results is the near-excision of the Dodgers. The only LA appearance in the list is a loss to the Sox in six (now the 12th most likely result, previously the 3rd). Thirteen outcomes now include the Cardinals, including six victories. The ratings system expected something akin to a 3-2 victory by the Cardinals over the Dodgers at home last night, so the rankings hardly budged. Tune in tomorrow for updates resulting from Game 2 of the NLDS and the opener of the fight for the American League Pennant.